South African parliament taking steps toward land expropriation. On Tuesday, the South African parliament created a committee to explore amending the country’s constitution to allow uncompensated expropriation of white farmers’ land. President Cyril Ramaphosa, who took office after Jacob Zuma resigned two weeks ago, has made land expropriation a key platform point. 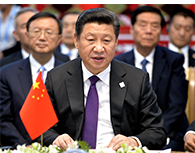 China considering eliminating presidential term limits. On Sunday, China’s Communist Party announced that it proposed amending the country’s constitution to remove presidential term limits, which would allow President Xi Jinping stay in office indefinitely. The government has responded to backlash against the proposal by censoring critical articles and social media posts. SCOTUS rules that immigrants can be held indefinitely. On Tuesday, the U.S. Supreme Court ruled that bond statutes permit the government to detain immigrants indefinitely without a bond hearing. The case was previously deadlocked, but Justice Gorsuch’s appointment allowed for a majority to be reached. Justice Breyer, dissenting, wrote that the court’s interpretation of bond statutes would result in the violation of immigrants’ constitutional rights.